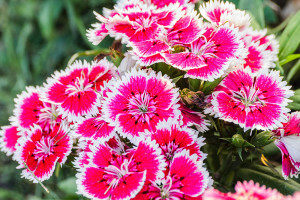 Did you know that there are many plants that can be cut back during the summer months and will rebloom? Reblooming perennials look beautiful in early summer, but tend to lose their stellar appearance as summer wears on. When your perennials start to look bedraggled and worn, this is the time to lift them back in shape with a little pruning. Some perennials just need a little haircut to remove spent blooms and they will provide a new flush of fresh foliage. Some of the best rebloomers are spirea, nepeta, salvia, kalamaris and some varieties of dianthus.